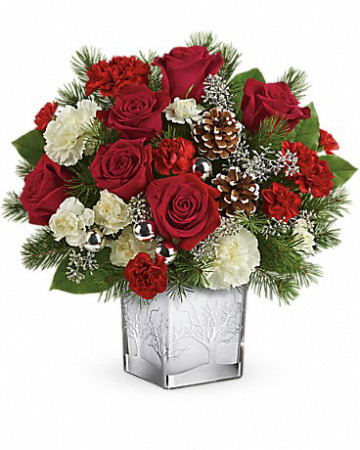 ** Cube is 4" bright shiny metallic, NOT engraved** Bursting with fragrant Douglas fir, Red Mini carnations, Red roses also added at middle price, frosted pinecones, and dainty white wax flower or gypsophila . 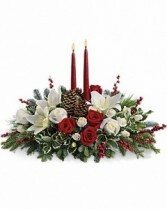 Stunning red and white roses, white spray roses and chrysanthemums plus all of your holiday favorites like pinecones, berries, holly, Christmas greenery and two tall-tapered candles. A brilliant way to send your Christmas wishes in style. Approximately 21 W x 17 H *Number of roses decreases or increases with Price. 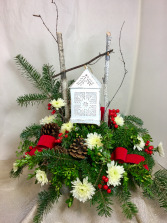 Lovely English Boxwood, White Pine, Bittersweet Berries, Pinecones and bright chrysanthemums host a frosted white lantern (battery Operated) suspended from Birch branches. Ever so festive and pretty!! 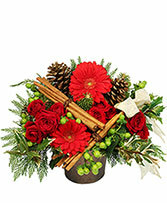 Boost to $59.95 for additional fresh flowers. OUR DELIVERY AREA ONLY - SEE ZIP CODES on bottom of home page.